How can we help people with medical memory loss manage their medications independently? After ten weeks of user research, ideation and prototyping, we have created a device entitled the MedMem Medication Management System. This low tech solution consists of three interconnected components: customizable pill boxes, a portable reminder system, and a pre-formatted notebook. As a whole, the MedMem system allows users to easily adapt to frequently changing medication regimens, remember medications through persistent notifications and externalize important medical information. My role: our team collaborated throughout all stages of the design process. However, my primary responsibilities included project management, interview moderation, 3D modeling and laser cut prototype development. To ensure that we maintained a deep understanding of our user groups, we focused heavily on user research throughout our project. 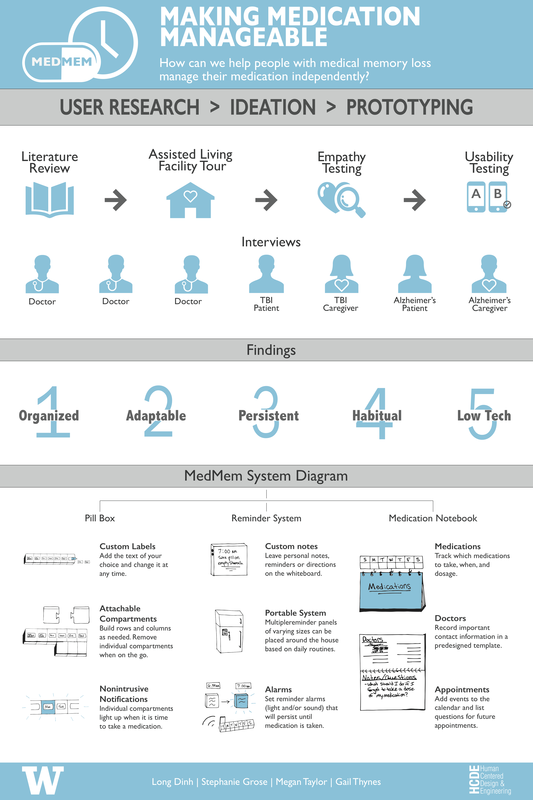 Entering a broad and complex design space, our team began our research with a short literature review to identify stakeholders and problem areas in the realm of medication management. We then ventured into the field and conducted interviews with doctors, Traumatic Brain Injury (TBI) patients, Dementia patients and their caregivers. These interviews gave us further insights about the difficulties of managing medications and allowed us to truly empathize with our users. Findings from our user research were compiled to create three personas, which were used as a reference and empathy tool throughout the project. Drawing directly from user research findings, our team compiled a list of design considerations to refer to during ideation. Additionally, we pulled out the most pertinent design considerations and created a top ten design requirements list. By generating ideas that satisfied these design requirements, we ensured that potential products would, indeed, be beneficial to users within our design space. To start off the idea generation process, each team member created several unique sketches of design ideas and user experiences. We then worked as a team to consolidate and refine ideas. After several design iterations, our team determined that our medication management system would encompass three subcategories: medication organization, reminders and record keeping. We created three refined sketches of our concept to present for user feedback. Rapid prototyping is just as it sounds: assembling a model of something very quickly. These low fidelity prototypes were fantastic for testing several design details simultaneously and at low cost. What material is best for connecting pill boxes, magnets or snaps? Glue them both to some cardboard and find out! Using gloves, clouded glasses and a distracting soundtrack, we tested our rapid prototypes with consideration for our users who may have reduced sense of touch, vision impairments and/or mild cognitive impairments. This empathy testing allowed us to put ourselves in the shoes of our users and maximize the usability of our design. One lesson that we learned while creating refined prototypes is that there is more than one way to convey an idea. Originally, our team decided that 3D printing was ideal for modeling our Lego style snap system. Unfortunately, the 3D printers that we had access to were not precise enough for the job. Lids came out the wrong size and the snaps did not fit together. Testing a different snap styles proved more troublesome. The printer was unable to render the finer details of the snap. After several failed printing attempts we took a step back and discovered another method to build the pillbox. We laser cut acrylic and built up pill boxes in layers. Instead of our snap design, we added clear Velcro circles to simply convey the idea of connection. Our reminder system is a laser cut mat board panel mounted on foam and strung with lights. Buttons are made from clay and a small clock is taped into place to represent an LCD screen. Our medication journal were revised and printed into a bound notebook. They are designed to organize information by key topics. They also work to reduce cognitive load using large icons and color. At the end of this ten week design sprint, our team presented our work at the undergraduate capstone symposium at the University of Washington, where we showcased our empathy building exercise and a Wizard of Oz style demo of our final prototype. MedMem was awarded the Undergraduate Capstone Award for 2015. At it’s current stage, our MedMem prototype remains largely conceptual. Moving forward our team would conduct another round of usability testing before exploring the manufacturing constraints for our product. Form factor for microprocessors and wiring would need to be considered as well as methods for charging portable reminder pods and pill compartments.